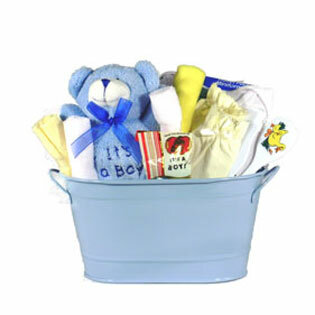 Welcome Baby Boy Gift Basket-What a sweet gift basket for a new baby boy to receive, our little blue tin can be used after the goodies come out. Mom can use it for a planter or to store nursery items in. Our little baby gift basket for boys is filled with a soft baby brush and comb set, a baby changing pad, soft baby wash clothes, little scratch mittens, a soft baby t-shirt, jelly belly "It's a Boy" jelly beans, a soft plush teddy bear and a travel size pack of wet wipes. 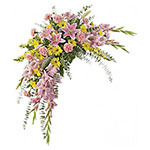 Send our cute little baby boy gift basket to say congratulations to the happy new mom and dad.